What should i do with my guinea pig during a storm? A storm is any disturbed state of an environment or in an astronomical body’s atmosphere especially affecting its surface, and strongly implying severe weather. Whenever it storms it can be quite a scary time for a guinea pig. They hate loud bangs and things that rattle and bang against their cage or hutch. During a storm, a guinea pig should be kept safe. The best thing you could do for them is to take them inside either into your home or into an outhouse which is secure and safe for them and keeps them away from the elements such as the wind, rain or snow. Keeping them away from the elements means that they are away from harm and potentially in a warm place. If you can put them in your home, this is the best place for them and will ensure that they are warm and secure. When they are inside your home they will benefit from the time they spend with you and your family. The warmth of your home will benefit them from a health point of view. It will be so much better for them than being outside. They will also benefit from the social interaction with you and your family. 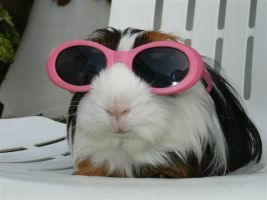 They are social creatures and love to spend time with others, whether guinea pigs or people. If you can’t bring them into your home, then consider putting them in an out house or shed which is dry and free of drafts. This too is a much better place for them than being outside exposed to the elements. Even if the outhouse is dark, the guinea pigs wont mind as they are well accustomed to living in the dark and can move around in pitch black without any issue at all. It is how they survived in the wild and kept away from the clutches of predators. So if you have an outhouse then this is the next best option to being in your home. Can Guinea Pigs Catch Colds From Humans? As an owner it is always a bit of a concern when a virus or cold is had by a person in the same vicinity and you have to handle your guinea pig. The risk of passing on your cold or virus from guinea pigs can be worrying, as who wants to actually pass on their cold to a piggy? So can guinea pigs catch colds from humans? Fortunately, guinea pigs are not prone to get viral infections. However, this doesn’t mean that they are immune to illness. Unfortunately, they can get bacterial infections. This means that you do not have to worry about passing on your cold to your guinea pig. However, do be careful about passing on bacterial infections as they can cause a lot of problems for your piggy. They are very common in pet store purchased piggies and they can go downhill very quickly. A URI (Upper Respiratory Infection) will kill a guinea pig quickly if it is not addressed. If you have any concerns about your piggy, please seek out a good veterinary surgeon in your area who is guinea pig friendly. They will be able to properly diagnose and give treatment to any issues that your piggy may be facing. There is no substitute for good veterinary care. Have you ever left your guinea pigs out eating grass for a long period of time? I’ve done this on several occasions expecting them to enjoy their time out on the grass. I know the grass is good for them to eat and there are no pesticides on it so I am completely happy for them to do so. Whenever I do this and let them out onto the grass, they go absolutely mad initially and eat every blade of grass in sight. They will do this for a time and then chill out after their feed. However, one thing I have noticed is that when they do eat a lot of fresh grass, their poo gets rather gooey. I’ve noticed this several times, the poop get’s longer and then messier (i’ve become a bit knowledgeable on guinea pig poop!). The more messy their poo is the more upset their stomach is. Usually it is shorter and drier. They also tend to hold back in eating the grass after some of the time. Piggies are also pretty good at sensing when they have had enough food. So can guinea pigs eat too much grass? What’s happened is that my piggies are not used to eating fresh grass a lot. So when they eat lots of it, they get a slight upset stomach. Their diet mainly consists of dry meadow or timothy hay, guinea pig pellets and some choice vegetables and so are not used to eating the fresher grass on my lawn. Increase their time out one grass to get their bodies used to eating fresh grass. I could give them fresh grass in their pen on a daily basis. I could limit their time out on the grass because it gives them gooey poop. I’ve opted for first option, much their pleasure and is the cause of much increased wheeking whenever they sense it is coming. Fresh grass is still great for them to eat and they absolutely love it. So, in answer to the question, guinea pigs can eat too much grass if they are not used to eating it. But even with this, it’s not the end of the world if their poop is a little bigger than usual or a bit more gooey. Their bodies are just getting used to eating fresh grass. Just make sure grass is pesticide free and doesn’t contain any excrement from any other pets.